This evening I decided to make "Mexican Style Pepper Jack & Spinach Stuffed Chicken Cutlets" which are a spin-off of my Italian Style Spinach & Cheese Cutlets. I have one word to describe this dish...AWESOME!!! They are full of flavor and really satisfy my taste and craving for Mexican food. I really, really liked these -- even more so than my Italian version. I decided to use my homemade recipe for Taco Seasoning which is so simple to throw together, has no wheat and it makes enough seasoning to use with this recipe and still have a little leftover. For the filling, I used about 1/4 cup of ricotta cheese to mix with my spinach to serve as the "glue" to make a spreadable mixture to spread on the cutlets. I then placed a piece of Pepper Jack cheese inside each before rolling the cutlets up. 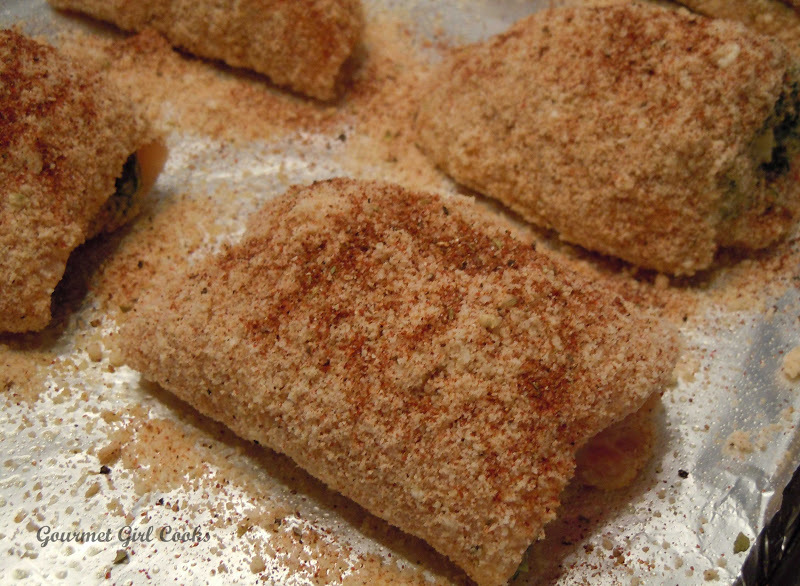 The taco seasoning is used to season the spinach cheese filling, the breading and then sprinkle on top before baking. This recipe is full of flavor. If you have young children or you do not like food that is a little spicy, you may want to substitute plain Monterey Jack cheese or another cheese of your choice. I topped the baked cutlets with a couple of strips of Pepper Jack cheese and returned them to the oven to let it melt a bit. 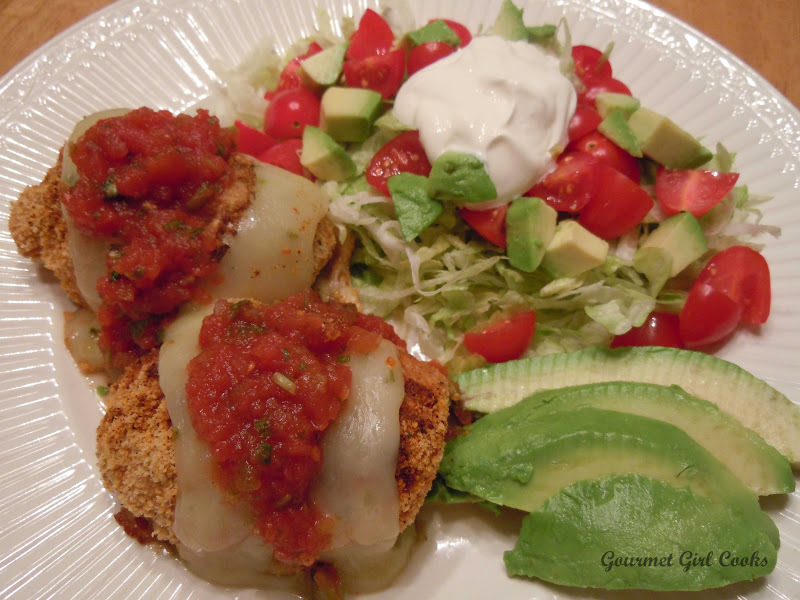 I served each cutlet topped with a spoonful of salsa and paired it with a side of shredded lettuce, diced fresh tomatoes, avocado and a dollop of sour cream which went really well with the cutlets. I just hate it when you go to a Mexican restaurant and they act like fresh tomatoes and lettuce are precious gems and they give you such a small portion that it doesn't even qualify as a "garnish" (and that is after you've paid extra for it too). My advice to you when baking these cutlets is that I strongly suggest you use non-stick foil (like Reynolds) because any cheese that melts out or escapes from your chicken bundles while they bake is not lost or stuck on the foil forever -- it lifts right off the non-stick foil in its little puddle-shaped ooze and you don't lose any of your cheese. I snapped a few photos below as well as the recipe. Enjoy! Preheat oven to 375 degrees F. In a medium-high non-stick skillet, put a drizzle of olive oil and quickly wilt the spinach leaves; remove to a mesh strainer and press as much liquid out as possible; place in a medium bowl and set aside to cool. Place the cooled, well drained spinach on a cutting board and chop well; add back to bowl along with 1 teaspoon of taco seasoning, salt and pepper, to taste, and ricotta; mix well. Slice half of the 8-oz brick of Pepper Jack cheese into approximate 1/4 in wide strips (for the number of cutlets you are using) to roll up into each cutlet. Cut the remaining half of the brick of cheese into smaller strips to melt on top of the cooked cutlets before serving. Mix all breading ingredients together in a shallow bowl or plate. In a medium bowl, make egg wash by beating an egg with a splash of light cream and pinch of salt and pepper, to taste. Lay chicken cutlets out on a cutting board or work area and evenly divide the spinach filling between the cutlets, spreading the mixture on top of each cutlet; roll up lengthwise. Dunk the stuffed chicken bundles in the egg wash and then roll in the seasoned almond flour crumbs and place seam side down on a baking pan or sheet covered with non-stick foil that has been very lightly sprayed or coated with oil. Lightly sprinkle the tops of the breaded cutlets with a little additional taco seasoning. Bake at 375 F degrees for about 30 minutes or until done. 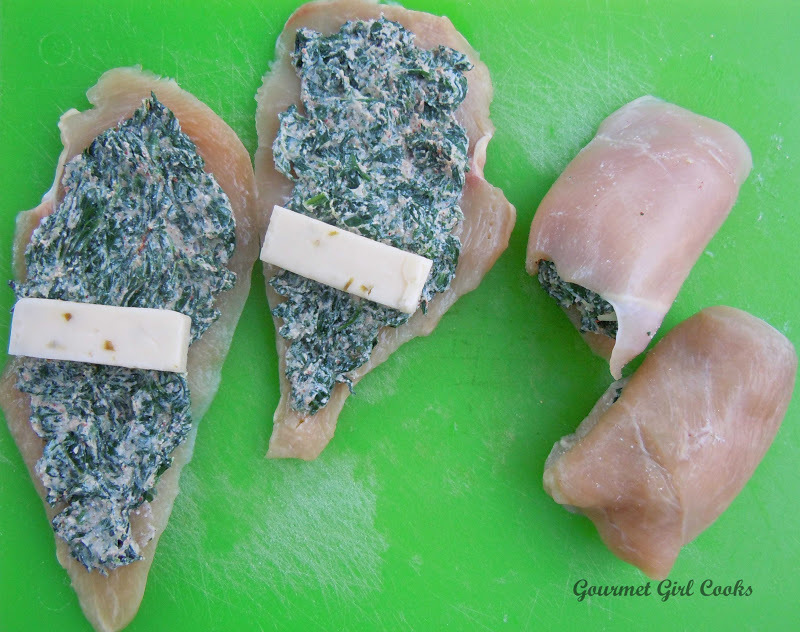 Remove from oven and lay strips of Pepper Jack cheese on top of cooked stuffed chicken bundles and return to the oven for another 3-5 minutes, or until cheese begins to melt. Let cool about 5 minutes to allow cheeses to set. Serve topped with a spoonful of salsa, if desired. This meal pairs well when served with a side of shredded lettuce, diced tomatoes and avocados and a dollop of sour cream (like they do in Mexican restaurants). Being a "Wheat Belly" newbie, it's been very difficult to find foods that my "Midwest Meat & Potatoes" hubby and teenage daughter will eat. 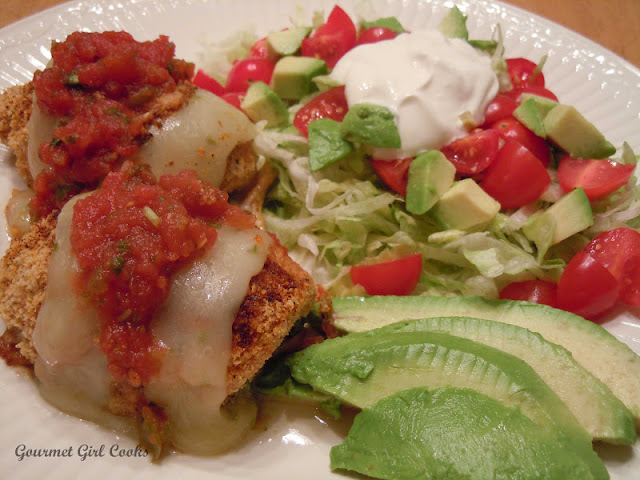 I made this recipe last night because it sounded so good and it was a BIG hit! Hubby loved it, daughter said it was a little "too spicy" (I may have added a little too much cayenne!) but they loved it. Thank you, thank you, thank you! I can't wait to try more recipes! Thanks Amy -- I'm glad to hear your family enjoyed this. You will find that all my recipes posted beginning 7/10/12 are wheat belly friendly (except a couple that I made for others to eat). On the right side of my blog, you will also find a link that will take you to the Wheat/Grain free recipes as well. I wish you the success that I have experienced! Thanks again! Hi! How did you make your salsa? Your recipes and photography are awesome! Wheat belly here too.....just loved this chicken reciepe my dh and ds loved it too! Thanks!